Carp might be the most challenging freshwater fish you will ever try to catch on the fly. Learn these secret techniques and patterns for catching this widely available fish. Fly fishing for carp is a personal obsession. Given the explosive wave of gear, flies, lines, and publicity surrounding carp on the fly, it’s obvious that many other anglers share my passion. And it’s easy to understand why. Carp are distributed throughout the United States and beyond. A carp can attain proportions that will overwhelm an 8-weight rod and make you wish you were using a 10-weight outfit. Even a carp in the three- to six-pound category will make a comparably sized trout seem anemic. Best of all, a carp will eat a well-presented fly. 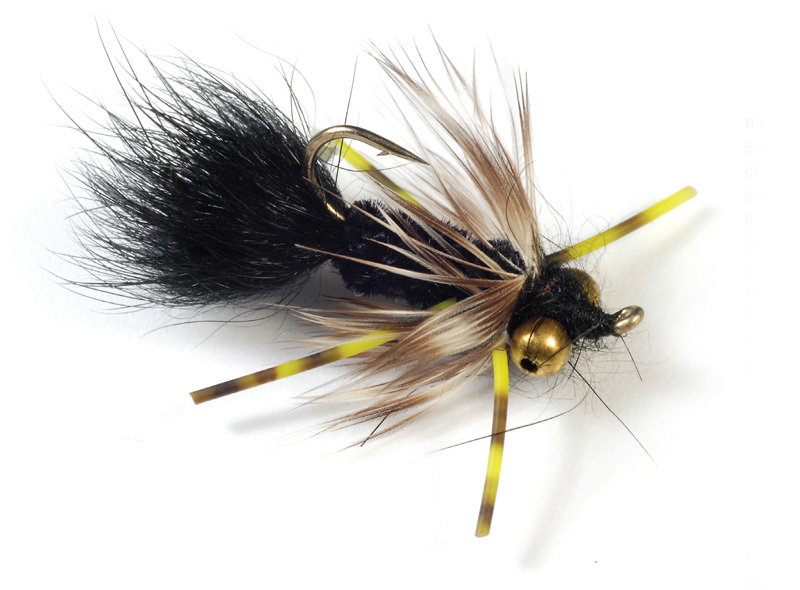 Carter Nelson designed the Rubber-Legged Dragon as a dragonfly nymph for tempting beefy bluegills, and it is perhaps the best redear sunfish (also called shellcracker) fly of all time. However, it is equally deadly on tailing and mudding carp. Tied with small bead-chain eyes and medium chenille to slow the fly’s sink rate, the RLD works especially well in the silt cloud created by feeding carp. The fly’s rubber legs are visible and tempting. There are several currently hot carp flies that closely match the RLD’s parameters. Barr’s Spork is a good example, and I’ve used it with excellent results. But the RLD has been in my fly box longer, so it nudges the Spork off my list of favorite patterns. Hook: Tiemco TMC 3769, size 10 or 8. Hackle: Black or grizzly webby hackle. Despite that happy fact, there’s what I call the “permit connection.” You can select the correct fly and make a perfect cast, and still a carp might refuse to strike. Unlike permit fly fishing, where on a great day you might cast to a dozen fish, a common day on good carp waters will provide many more excellent shots at fish, but they can still be tough to catch. If you have never seen the backing on your trout or bass reel, you will if you hook a good carp. Simply stated, carp are the stuff of a fly angler’s dreams. Converting those dreams into reality, however, can be a challenge. A muscular carp like this will expose your reel’s backing almost every time. Izaak Walton aptly described carp as “a very subtle fish and hard to be caught.” Carp might well be the spookiest fish you will encounter. Carp are in the Cyprinidae family of fish. The species in this family possesses Weberian ossicles, which is a linkage of small bones connecting their inner ears to their swim bladders. Consequently, carp can hear you sneeze yards away. Drop pliers or a tippet spool, bump the gunwale with a paddle, splash while wading, or slap a cast on the water, and the game will end before it starts. Ty Goodwin, an enthusiastic carp fly angler from Georgia, designed this pattern to take finicky carp in relatively clear, skinny water. When carp are at their paranoiac peak, eager to flee at the softest fly presentations, Ty’s Mean Old Dirty Frisco can be the magic bullet. “I wanted a fly that has a large, buggy profile that lands softly and sinks slowly,” he explained, “and the Dirty Frisco works pretty well for wary stillwater carp.” Cast the fly within inches of a carp’s nose, let it fall, and watch for a “tell” signaling that the fish has inhaled it. Oh, the fly’s name? Ty likes blues almost as much as fly casting to carp. Arthur Crudup, a classic bluesman, provides a musical backdrop for Ty’s tying desk. You can weight this pattern with a few wraps of .015-inch wire, but the non-weighted version is more effective. Hook: Mustad 3906, sizes 10 to 6. Mustad 3906, sizes 10 to 6. Abdomen: Awesome ‘Possum or any coarse black dubbing. Thorax: Black SLF Prism dubbing. Wing case: Black Swiss straw. Hackle: Purple dyed guinea bodyfeather. In addition to having perhaps the best high-frequency hearing of any freshwater game fish, a carp’s senses of smell and taste are extraordinary; sunscreen, sweat, fly floatant, motor oil, or similar substances on your fly may spell goodbye. If that isn’t enough, carp see better than a wary brown trout. A carp’s eyes have four types of cone cells—humans have three—so it can see everything that we see, plus colors in the ultraviolet spectrum. Fortunately for us, the fish’s keen vision is sometimes diminished by water turbidity. As if things aren’t tough enough, a carp has a sharpened sense of “touch” using sensitive lateral lines and barbules on the sides of the mouth. It can also distinguish between good and bad food using acutely sensitive nerve fibers inside the mouth. Anglers targeting carp on the fly must always remember this spooky litany and take steps to counter the fish’s sensory advantage. This simple fly is becoming my go-to pattern. John Bartlett, who blogs at Carp on the Fly as John Montana, combined a traditional soft-hackle fly with a San Juan Worm to create the Hybrid Fly. He added dumbbell eyes and a wide-gapped hook to create a pattern that takes carp that have their backs out of the water or are mudding several feet deep. The Hybrid is quick to tie and easy to modify: change tail color or hackle material and color, and alter the sink rate using different eyes. Montana favors golden pheasant for his soft-hackle material. I suspect that the fly’s effectiveness derives from its seductive movement, even when it is at rest. Many freshwater worm species of the Oligochaeta family feed with their heads buried in the bottom and their tails suspended and visible. There’s no wonder the Hybrid Fly is so consistently effective. Hook: Tiemco TMC2499SP-BL or CarpPro Gaper, size 8 or 6. Thread: Black or red 8/0 (70 denier). Eyes: Small black dumbbell eyes. Tail: Small or medium red Ultra Chenille. Hackle: Golden pheasant or chinchilla neck hackle. Stealth is the ticket to success. Most of the waters I fish are accessible only by boat. From a carp’s sensory viewpoint, any boat or wading angler is a source of sound. To catch carp on the fly, you must minimize all sound. Some boats are better at this than others. Aluminum boats are the worst offenders. Electric motors on any boat are equally bad. A stealthily paddled kayak is relatively quiet, and a canoe comes in a close second. Small improvements in a boat can make a difference. Use carpet or foam padding to minimize internal boat noise. Avoid dropping, banging, or scraping noises when approaching a feeding carp. It’s hard to be stealthy with oars; paddles and poles are much quieter when used properly. Despite a kayak’s inherent stealth, the low seat makes sight-fishing very difficult. All too often, a kayak angler spooks carp before he sees the fish. Friends and I have solved the stealth and vision issues by modifying a wide, ultra-stable fiberglass boat with poling and casting platforms to create a quiet micro-skiff that would be equally happy on a bonefish fl at. Carp are so sensitive to sound that we tend to pole the boat in search of feeding fish, then stow the pole in favor of a paddle to approach to within casting range; carp that would spook at the touch of pole on bottom will tolerate another yard or two of paddle approach. New, longer paddles designed for standup paddle boarding are perfect complements to a 16-foot-long graphite pole. Hogan Brown, another innovative fly tier bewitched by carp, has created a fly that works in clear water just as well as the Carp Devil does in murky stuff. It is also a bulky fly, but you can change dumbbell eyes to alter the weight to match the feeding conditions. I carry Hogan’s Carp Bait in several weights. It’s easy to forget that a carp can be a predator, eagerly inhaling small minnows and crayfish. Hogan developed the Carp Bait to take carp cruising the edges of the weeds looking for anything that pops out, including minnows. The best drill is to present the fly in front of a cruiser, give it a few short strips, and watch for a reaction. Sometimes a carp takes aggressively as soon as it see the fly, but other times it reverts to being schizoid and keeps on cruising. When that happens, Hogan switches to a Carp Bait with lighter eyes so that he can make the fly hover right at the fish’s nose. My regular carp fly fishing partner and I have enough success with Hogan’s Carp Bait that it has become a reliable favorite, both for cruising and mudding fish in slightly deeper water. Hook: Thread: Tan 6/0 (140 denier). Eyes: Dumbbell. Tail: Tan marabou. Abdomen: Tan marabou wrapped up the hook shank. Thorax: Gray san Scud Dub. Wing: Orange marabou topped with olive marabou.